One of Austria's most famous cakes, the Sachertorte, is marking its 175th birthday this year. The chocolate cake brought fame and fortune to its creator, a 16-year-old apprentice chef, and once sparked a long and bitter legal battle between two of the capital's finest cake-makers. "You have to understand, the Sachertorte is the aristocrat of Viennese cakes," an Austrian friend told me. We were sitting in the 19th Century splendours of the cafe at the Hotel Sacher in Vienna, with its red brocade wall paper and crystal chandeliers. On the marble table in front of me was a perfectly cut triangle of Sachertorte on a white porcelain plate - two layers of chocolate sponge spread thinly with apricot jam and covered with a thick, glazed, dark chocolate icing. On top of the cake was a round seal made of chocolate, with the words Hotel Sacher stamped on it and, at the side, an artistic swirl of unsweetened whipped cream. I paused, my fork poised over my plate, to ask my friend what she meant by aristocratic. "It is distinguished, but simple," she said. "It's made of the best ingredients but doesn't shout about its quality, not like one of those nouveau riche, over-the-top Black forest gateaux. Just look at how smooth the icing is." Sachertorte, along with apple strudel, is one of the best-loved Austrian cakes. It is available almost everywhere, from greasy spoon railway cafeterias to the elegant coffee houses of Vienna and Salzburg. I have been offered Sachertorte in apres-ski bars in the mountains, at birthday parties and at election rallies. In fact the cake has even been used as an ambassador for Austria. When the country was under European Union sanctions in the year 2000, because a far right party had joined the government, Vienna sent its foreign minister and a huge Sachertorte to an EU summit in an attempt to sweeten tempers. 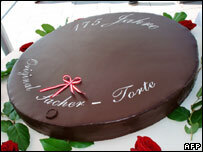 This year there seems to be even more Sachertorte around than usual because the cake is celebrating its 175th birthday. It was created by chance one day in 1832 when the chef to the chancellor, Prince Wensel Metternich, suddenly fell ill.
His 16-year-old apprentice, Franz Sacher, was called in to create a dessert that would not disgrace the prince and the Sachertorte was born. A few days ago I attended a small birthday party for the cake at the Hotel Sacher, which was founded by Franz Sacher's son, Eduard. The managing director Elisabeth Gurtler was running around ensuring that the guests of honour were supplied with sparkling wine. "Champagne goes very well with Sachertorte," she told me. "Where do you keep Franz Sacher's recipe?" I asked. "It is in my safe," she said. "Only a handful of people have seen it and they are sworn to secrecy. There is only one original Sachertorte... and it is ours." Over the decades, the Hotel Sacher has spent years in court fighting for its claim that it makes the original Sachertorte. Its most prominent rival was the Cafe Demel, another famous Viennese pastry-maker. 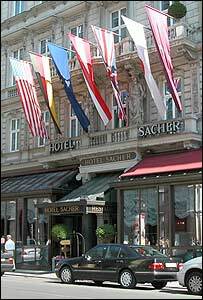 The Hotel Sacher eventually won. In the marble kitchens of the Cafe Demel, I watched the head confectioner, Dietmar Muthenthaler, spread melted chocolate on a slab of Sachertorte. "What is the difference between a Demel Sachertorte and one from the Hotel Sacher?" I asked. "I can't tell you exactly," he said. "But the Sacher says it uses three types of chocolate for the icing and we use just one, our own special brand of chocolate." It has been a long time since I first tasted Sachertorte and I can't remember now whether it was at Cafe Demel or at the Hotel Sacher. But I do remember being distinctly disappointed. The cake was dry. The fabled chocolate icing was too sugary and curiously sharp in flavour. It wasn't unpleasant but I had been expecting something different, something richer, more along the lines of an American brownie. It just wasn't chocolaty enough. After that I did give the cake a chance, trying it out in a number of Austrian cafes. But I was always forced to the same conclusion: Sachertorte looks better than it tastes. And so I stopped ordering it, until one winter's day when I took refuge from the cold in an old smoky cafe in the centre of Vienna. The waiter came over to take my order for coffee. "Do you have any cake?" I asked. "It's home-made," he said, "and we haven't got anything else." "All right, then," I said, "bring me a Sachertorte." He returned with my coffee and a piece of dark chocolate cake. I tasted it cautiously. It was delicious. The sponge had been made with ground hazelnuts and lots of melted chocolate, which gave it a moist, rich texture. The icing was light and creamy with a strong charge of cocoa. The thin layer of apricot jam gave the cake a subtle tang. I had finally discovered the secret of the Sachertorte. It needs to be home-made with extra chocolate. But I have to confess, I still prefer apple strudel. From Our Own Correspondent was broadcast on Thursday 31 May, 2007 at 1100 BST on BBC Radio 4. Please check the programme schedules for World Service transmission times.